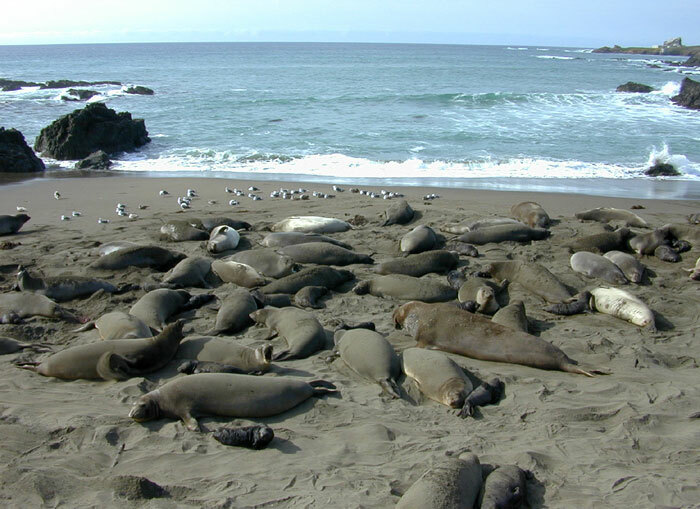 Thought to be extinct in the northern hemisphere by the end of the 1800s, due to heavy predation by sealers for hundreds of years, a small group of northern elephant seals was discovered on Guadalupe Island (off Mexico) in the 1880s. Eight individuals were sighted on the island and scientists killed seven. At this time not much was known about the northern elephant seal so the scientists wanted to collect all the specimens that they could. They believed the species to be extinct after this collection. However, there must have been at least a few individuals left because small populations started showing up on the offshore islands of Baja California, Mexico and central and southern California, USA. Slowly the population grew until it was estimated at more than 150,000 in 2000. Up to 1964 southern elephant seals were hunted by native peoples of the southern hemisphere as well as sealers. Their populations decreased but were never considered to be extinct (as with the northern elephant seal). 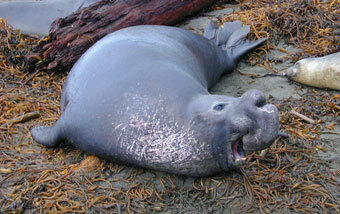 In 2000 the population of southern elephant seals was probably close to 750,000. Many of the rookeries appear to be keeping a stable population level whereas a few areas at the tip of South America have been steadily increasing. 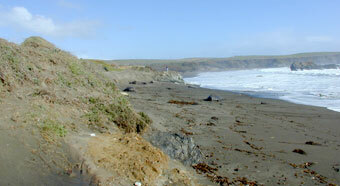 In 1990 northern elephant seal individuals started to come ashore at Pt. 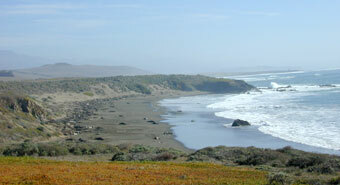 Piedras Blancas, near San Simeon on the central California coast. Although there were a few places on the California coast where they came ashore on the mainland, most of these areas were inaccessible (as were their main populations on the offshore islands)to most people. 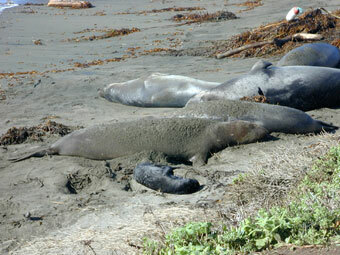 There is no indication that elephant seals ever used this area at San Simeon in the past. With their increased protection and population increase it could be that the other rookeries were becoming overcrowded. At San Simeon the beaches are right by the highway and there is a nice cliff that is only ten to fifteen feet high allowing easy viewing of the beaches by humans. During summer the molting individuals can be seen - the babies and females in early summer and the males in later summer. 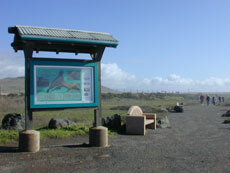 During winter the reproductive process can be viewed and these beaches are then called rookeries. 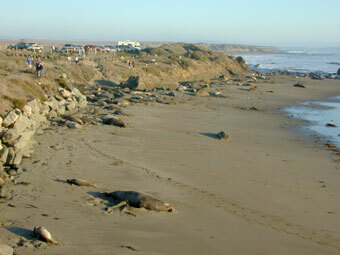 The first pup was born at Piedras Blancas in 1992. 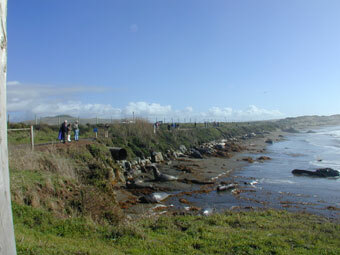 Over 2,000 babies were born in the San Simeon rookeries during the winter of 2001/2002. Many of these perished due to natural causes (perhaps as many as half of them). During December 2002 the first baby was born on December 19/20, the second born on December 20/21, and the third on December 22/23. This period was during a time of very high tides and storms. The storms removed a lot of sand from the beaches, making the available rookery area much smaller than usual. The high tides made it difficult for the early females to protect their babies. 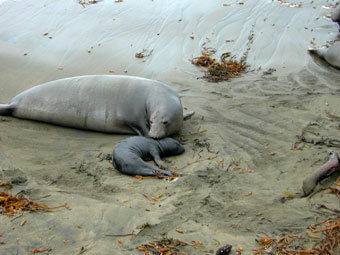 The bulk of the San Simeon babies are generally born in mid to late January. Population graph for Piedras Blancas elephant seals, photo taken at the Friends of the Elephant Seal Visitor Center in San Simeon, CA. With the protection of marine mammals by many countries, the future of both species of elephant seals appears to be bright. 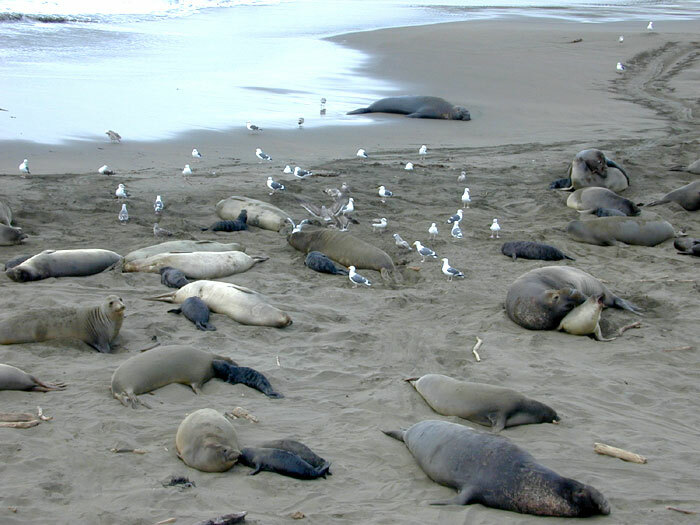 It is believed that the beginning of a new breeding population on the San Simeon coast in California near humans may indicate that there is crowding at the usual colonies and this is a population expansion. In the United States the Marine Mammal Protection Act of 1972 has helped all species of marine mammals (including the elephant seal) coming into US waters. 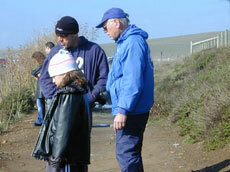 Many local volunteer groups assist marine mammals who are wounded and abandoned young. 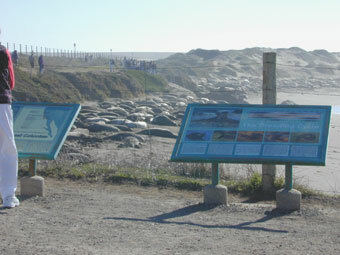 In the case of the San Simeon elephant seals there is a large group (the Friends of the Elephant Seal) that has raised money for interpretive signs at the San Simeon beaches as well as a group of docents (the blue coats) that volunteer to be available almost every day when there are animals on the beach. These docents are well trained to explain the natural history of the northern elephant seal and the coexistence of man and elephant seal seems very harmonious. 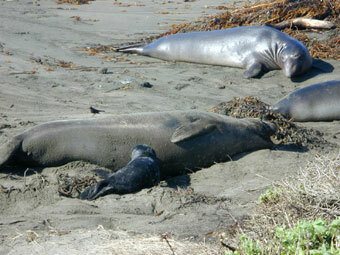 You can contact the Friends of the Elephant Seal at (805) 924-1628 or visit their website at www.elephantseal.org. They have a nice visitor center in San Simeon. 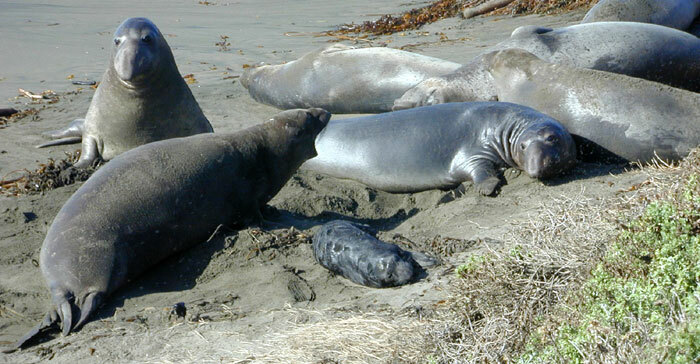 If you decide to visit the Piedras Blancas elephant seal rookery you can plan your visit to coincide with molting or reproduction by using the above timeline. The information known about the northern elephant seal is much greater than that known about the southern elephant seal especially because many people are able to easily see the northern elephant seal. When animals are caught, because they are in unsafe places or are injured, they are tagged with a simple plastic tag. 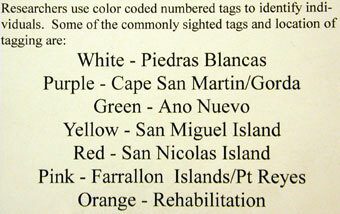 Each rookery location has its own color plastic tag so animals can be tracked if they change locations. 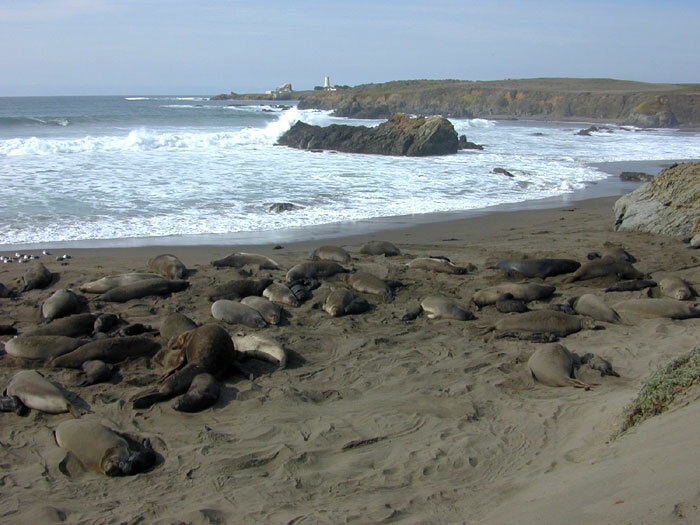 The Piedras Blancas rookery has individuals from many different locations. If you notice one of the plastic tags on the hind flipper of an animal be sure to note its color and report it to one of the docents. 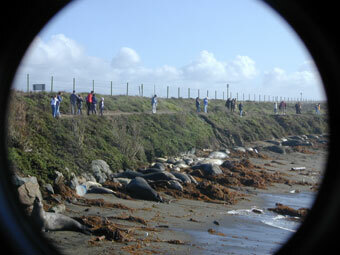 The docents provide a wealth of knowledge and monitoring of this new population of northern elephant seals. 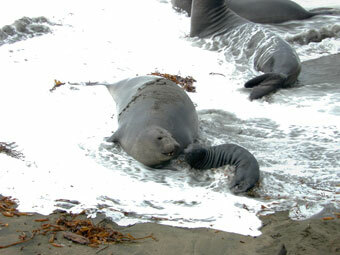 The elephant seal (both species) is a unique marine mammal in having its reproduction one of the most predictable, exciting, and easily viewed by humans. In the 21st century we are lucky to have such easy access to this species in California. Always remember that all marine mammals are protected in the United States. Enjoy your viewing either by this website or in person (even better) without disturbing these magnificent creatures. Can you see the beachmasters (one asleep, one starting to mate)? Can you see the newborns and a nursing newborn? Can you see the female with two pups (twins or adopted)? It is a rare thing to see a mom with two pups. Can you see a sneaker male by the water? This is a very active rookery. 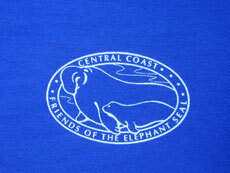 Thanks to the Friends of the Elephant Seal for their kind permission to use their graphics in this website.